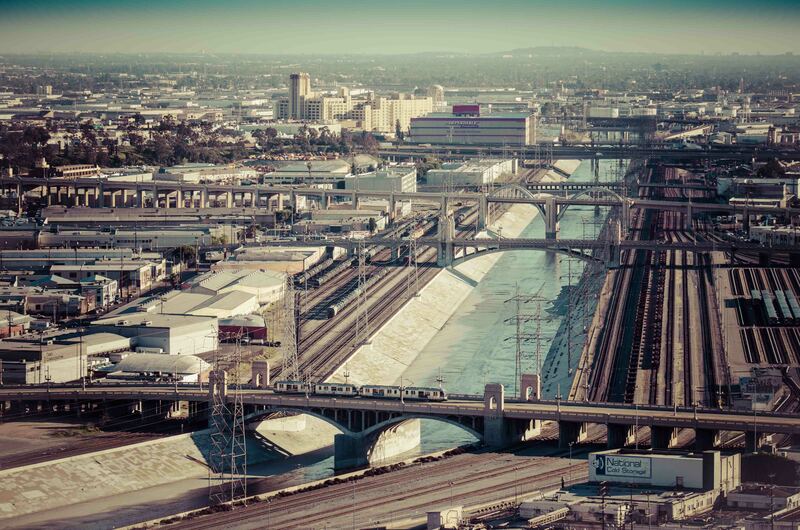 ART OF TRANSIT: A Gold Line train bound for East Los Angeles crosses the 1st Street Bridge over the Los Angeles River on Wednesday afternoon. Click above to see larger. Photo by Steve Hymon/Metro. Best breakdown I’ve seen yet on where the major candidates stand on a variety of issues, including project acceleration, lowering the voter threshold for transportation tax increases, rail versus buses, the route for the Westside Subway Extension in Century City (i.e. should it tunnel under part of the Beverly Hills High School campus), a 710 tunnel, adding more toll lanes in Los Angeles County and moving the north runway at LAX, among other questions. While the candidates often agree, there are certainly differences. Put down your jelly donuts and read this, people and/or voters!! Good piece on Supervisor Zev Yaroslavsky’s website about the Sepulveda Pass project on the 405. The gist of it: many elements of the project will be finished this year but one challenging section around Montana Avenue and Church Lane will see work carry over into 2014. In that area, utility relocations have been particularly problematic. These are early estimates — usually the federal government takes about a year to compile all the information and come up with a firmer number. California fared worse than the nation with the state seeing an estimated seven percent increase in deaths from 2011 to 2012, with 2,994 fatalities. Writer Chris Turner says it’s no surprise transit often fails to capture the public’s imagination — too often bus stops and train stations are designed as little more than an afterthought. His suggestions include making the bus stop a sanctuary, a cafe and/or a community gathering place. Check out a very cool photo with the post of a transit line and green space in Germany. The fourth part of Streetsblog’s interviews with the five leading mayoral candidates is with Councilman Eric Garcetti, who discusses the Metro Board and busways. They like the way things are today where train stations and bus stops should only serve one purpose of waiting for the train or the bus and nothing else. And they use claims like we don’t want it to be too crowded or it’s not going to work or it adds up to more queue or whatever. No, no, no to any new ideas hence, these people hinder any real progress in getting anything done. People don’t like new ideas that work elsewhere because they’ve never experienced it. Majority of the people who are afraid of new ideas with regards to transit is because they have never taken a trip outside of the US to see and experienced first-hand what the rest of the world is like when it comes to running mass transit. For many people in LA, the extent of their “trip abroad” is going over to Tijuana. And it’s sad it has to be that way when LA is such a diverse city which has a lot of immigrants and expats from abroad who if Metro just asked them for their advice, they can probably tell them what Metro is doing wrong because these people are the ones who go back to their countries every now and then and these people are the ones who are more likely to be the most knowledgeable and experienced in riding transit in cities that get mass transit right. Why can’t Metro ask the people living in Chinatown, Monterey Park, Koreatown, Little Tokyo or Torrance to see what these people think about LA’s mass transit and what’s lacking between their experiences in riding mass transit to places like Beijing, Shanghai, Hong Kong, Taipei, Seoul, Busan, Tokyo or Osaka? It’s as if like Metro has a fear of not asking the Asians for anything. You would think that the common sense solution to make transit right is to ask Asians, which we have plenty of here in SoCal, on how Metro stacks up to the best transit oriented cities in the world. Or, why can’t Metro ask the countless of foreign expats and business execs working in Downtown LA high rises office buildings on how LA Metro is compared to where they used to live or the cities they go on business travel often? You have MNCs and major consulting firms right there in Downtown LA which has a diverse background of Americans from other cities, Europeans, and Asians. It’s as if like Metro has a fear of not asking the globe-trotting businessmen and businesswomen. You would think that the common sense solution to make transit right is to ask globe-trotter, which we have plenty of here in SoCal, on how Metro stacks up to the best transit oriented cities in the world. From the start, Metro doesn’t ask the right questions to the right people. And they wonder why they come up with wrong solutions. Thanks Erik — bought a used telephoto lens recently. Good for pics from MTA building — this was taken from window right outside Art Leahy’s office. Except for the proposed 710 freeway extension tunnel, I’m not seeing huge differences in what Wendy Greuel or Eric Garcetti favor. I am a little disappointed that they both point to the Orange Line as a successful example of bus rapid transit. The Orange Line was a half-baked compromise at best. In other words, better than doing nothing. But to build more of such lines would be sad use of resources, including money, political capital and right-of-ways. I doubt that either candidate has ridden the Orange Line for any length of time, at commuting hours…. Orange Metrolink station is a great example of what at least half of our stations should be like, although very ambitious, it would be great; It probably wouldnt work for subways though, however, I wait 10 mins for a layover, and its nice to lay in the grass right next to the “platform”. There is a Ruby’s, which I never eat at, but its good to know I could if I liked to; and also bathrooms, which really save the day. Ive had this issue lately, and it would seem very convenient if there were mailboxes at the stations (snail mail is not all dead). As I was crunched for time between rides, transfers, and just wanting to get home, it was a little difficult to mail a piece. I couldve set it on top of my mailbox, but in a dash, I put the letter in my bag and left. It would also be kinda neat if like the platforms, a screen displayed above ground could tell us what time a train is going to arrive. I feel this would entice people to jump on down if one would be there within five minutes. One day hopefully can work for metro and its planning committee, because to me it feels as if EVERYONE that works with MTA never ever took public transit a day in their lives. But I am glad that they acknowledge the public’s feedback, good and nimby. The irony of Transit Riders post is exactly why it is DIFFICULT to have stations with amenities. There are benches and seats for waiting for connections. Too many people laying in the grass, which can kill the grass, is seen as a eyesore for many as it is a transit station, not a park. As for the Rubi’s that he states “Which I never eat at” means that businesses who take the risk to provide an amenity at the stations may go out of business because “transit riders don’t buy thing (are cheap or don’t have the money to do so). We are a free market system that depends upon citizens buying things from businesses to survive. This is a reason it is so hard to get private businesses to take the risk of providing amenities in stations, they all point to riders like Transit Rider. I would suggest that we patronize a business if we want it to survive and continue to be part of a station. While there are some stations that don’t depend upon riders for success, to have amenities at stations that are somewhat isolated, it makes all the difference in the world for someone to take that risk and open a business to serve riders there.